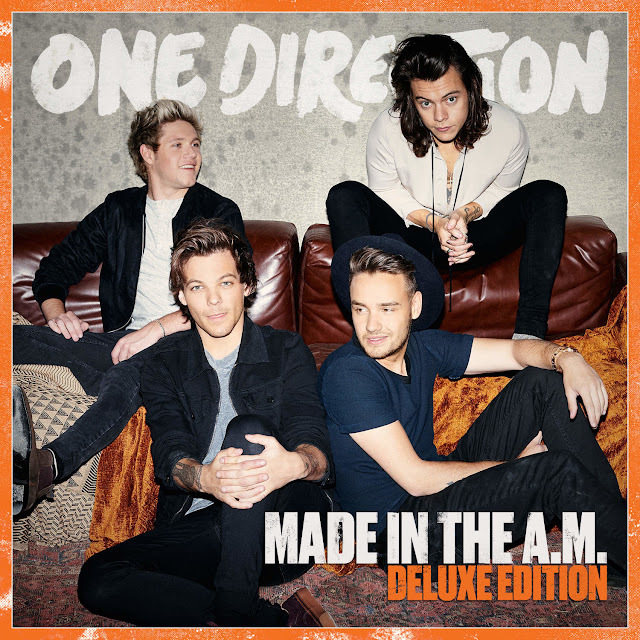 I digress, One Direction's fifth studio album officially released today and it saved me. I feel rejuvenated, like a totally brand new Francesca. Those four boys ruin my life day by day and I accept it with open arms. I pay for them to break me. It's fine, I'm fine, everything's fine. I don't remember if I did this four their fourth album Four, but I'm fairly certain I did this for their album Midnight Memories. Or maybe I did that on my music blog...I don't remember. Who cares. Basically, I'm just going to ramble on about each song on the deluxe edition. None of it is going to make sense. Most of it is going to me screaming about Harry Styles. But maybe it will be entertaining. More like HEY "BITTERSWEET SYMPHONY." I love that song. The Verve are a great group and I was totally digging the vibe I got from this track. Definitely a good start to the album. This song is my sh*t. This released over the summer and I lost my sh*t then and lost it again when I listened to MITAM all the way through for the first time. Even my seventeen year old brother likes this song. You can get down to this song (especially the Big Payno remix)(I cannot say that with a straight face)(he's cute though). I love driving to this song. I love driving to One Direction in general. I just love driving to good music and One Direction just happens to have great music. It was 40 degrees this morning and I was still driving with my windows down so I could scream this song out of them. The amount I love this song should be illegal. ILLEGAL. Harry's note at the end of this song is the reason why I'm going to graduate college. Again, this song was released a while ago as a single or early track, whatever you want to call it, so this wasn't a new listen. 5. "End of the Day"
I love verses for this song. I don't dislike the chorus (I find myself singing it more than I'd like toe admit), but the verses for this song are just so great and they make me want to sway and swing and just be a total goof. 6. "If I Could Fly"
More like IF I COULD CRY. This song makes me miss somebody that I never even had. My heart aches when I listen to this song and I was literally like crying on my drive home when this came on. Warning: this song will make you emotional for absolutely no reason. You'll probably want to hug Harry afterwards and coddle him and ask who hurt him. I always forget about this song and I don't know why. It's quite nice! It's very relaxing and it makes for a very peaceful drive home. I am just so, so proud of these boys for this album. This is a very non-1D song and yet it still works. They're so versatile, I can't stand it. If you want to dance around and shimmy and just have a good old time, listen to any One Direction song. I'm kidding (but not really). This song is just all around great and the grunts are an added bonus, honestly. Okay, beyond the fact that this is a fun song, I literally will snap a video of myself every time I'm listening to it to send to my roommate whose name is Olivia. It gets awkward when I sing it to her, but I generally do it anyways because I am a piece of trash and find the need to make 1D always relevant and come up in conversation. Harry did a nice job on this one, yep, mhm. WHAT A FLEETWOOD MAC TRIBUTE. I'm still crying over the mere existence of this song. It's perfect, it's absolutely freaking perfect. Oh look, another song Francesca can bawl her eyes out to. I'll love you goodbye, Harry. Or Liam. Or even Niall, like I'm genuinely not picky. 12. "I Want to Write You a Song"
Also known as the song that will make you want to cry for no reason because it's so delicate and cute. This is just such a feel good song that makes me want to stomp my feet around and make like get up on to a bar and start dancing like I'm in Coyote Ugly or something. I dunno. It's a solid tune! 15. "Walking in the Wind"
This is my favorite song on the album, without a doubt. Harry said it was Paul Simon inspired and from then on I was head over heels in love with it. Give it a listen so you can understand what I'm talking about. It just gives you that road trip feeling where you sort of feel on top of the world, if that makes any sense at all. When I first saw the title "Wolves" on the track list, I assumed it was going to be a darker track or something along the lines of "Clouds" from Four. Boy was I surprised when I heard this upbeat song that makes me shimmy my shoulders and bop back and forth. This song made me cry because it's just so raw and it's just the perfect end to the album. It's sort of one of those "it's been real" sort of songs where it gives nice closure to the album. I don't know, I just think it was the perfect way to end their last album before they go on their little hiatus. Jesus Christ, either Made In The A.M. was the greatest goodbye album of all time or the best transition into a more adult song when they've all matured some over their small break from touring and making music as a group. As always, I am optimistic and hopeful that those four idiots will be back at it in a couple of years. But even if not, they have an incredible five album discography and this fifth album was the perfect cap on the end of a musical evolution.